After three years of refinement and a few dozen rounds of prototyping they have created a fully functional prototype with a sleek design. It’s a project they are truly excited about. However, “Due to the large manufacturing and development costs we will have to incur, we are limited in our ability to bring this to market,” says Purcell-Lowe. Therefore, they have taken their project to Kickstarter.com. While there have been other automatic bartending machines created for clubs and bars, there has yet to be one created and priced specifically for the home appliance market. “We wanted to create something people could actually afford and use in their own kitchen,” says Purcell-Lowe “not just something they could only dream about.” Somabar stands at 15’’ tall and fits easily next to your coffee maker. 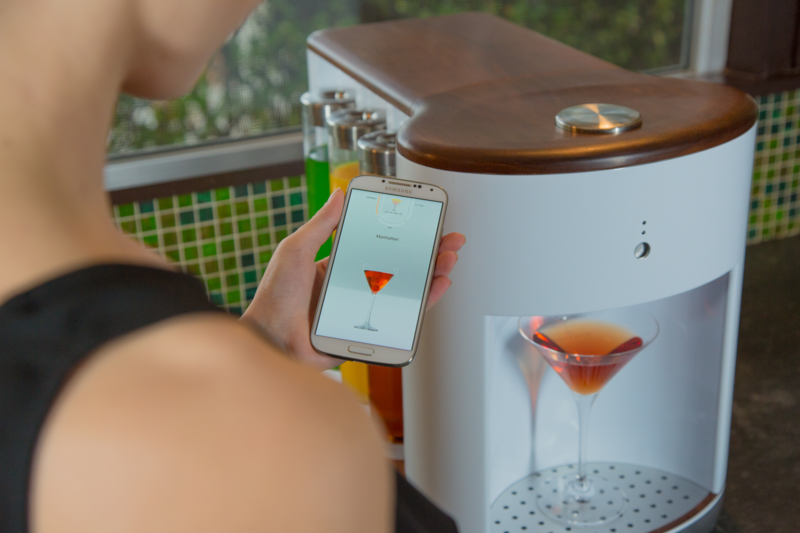 It uses a Wi-Fi connected ordering system controlled through an Android and iOS compatible app with the ability to make 12 drinks a minute. But, what makes Somabar even more unique is that its patent pending technology is able to infuse craft bitters, while also thoroughly mixing every drink, before being poured into your glass. Its six liquor containers and bitters container, also called Soma Pods, are portable, dishwasher safe and easy to refill. Somabar is self-cleaning using an internal water-flushing system ensuring that every cocktail made tastes like your first. It boasts an interactive menu of over 300 cocktails and makes each drink creation in under 5 seconds. Dieser Eintrag wurde veröffentlicht in Crowdfunding, Development, English, Fun, General, Hardware und verschlagwortet mit cocktails, kickstartet, robotic bartender, somabar von Sebastian Trella. Permanenter Link zum Eintrag.